Those who are frequent travelers to Tokyo might be familiar or aware of the famous 梅園 Umezono in Asakusa which sells traditional Wagashi. There's also a traditional Wagashi house called 梅園 Umezono in Kyoto (actually more than one if we count all its outlets) but it is not affiliated to the Tokyo counterpart. The one in Kyoto was established in Kawaramachi and has opened several outlets, including this うめぞの Cafe & Gallery (pronounced as "u-me-zo-no) which is targeted at the younger crowds with a menu that includes hotcakes, French toast and raw gluten parfaits. If you are after barbecue or grilled meats, chances are you will head to a western steakhouse or Korean BBQ house. But what if you prefer a mixup with a more eclectic selection of foods? Fret not, there's Fat Lulu. Opened by the same founders of Five & Dime, Fat Lulu is a truly hip eatery whose kitchen is run by two #Samsong chefs of opposing personalities. Chef Sam is the BBQ dude who enjoys burning his food because #noburnnotaste while Chef Song is the cool-headed dude who doesn't joke at making desserts that #tastesdope. There's no wafting smoke or raucous sounds of inebriation inside, but the space is full of spontaneity yet welcoming. Oh my god...what s*** did I land myself into for ordering such a huge sandwich? I didn't expect the legendary Kyoto egg-sandwich to be such a monstrous size. I'm sure you must be laughing at the photo and thinking "Very Big meh?" OH YES, IT IS! Probably the biggest of your life. 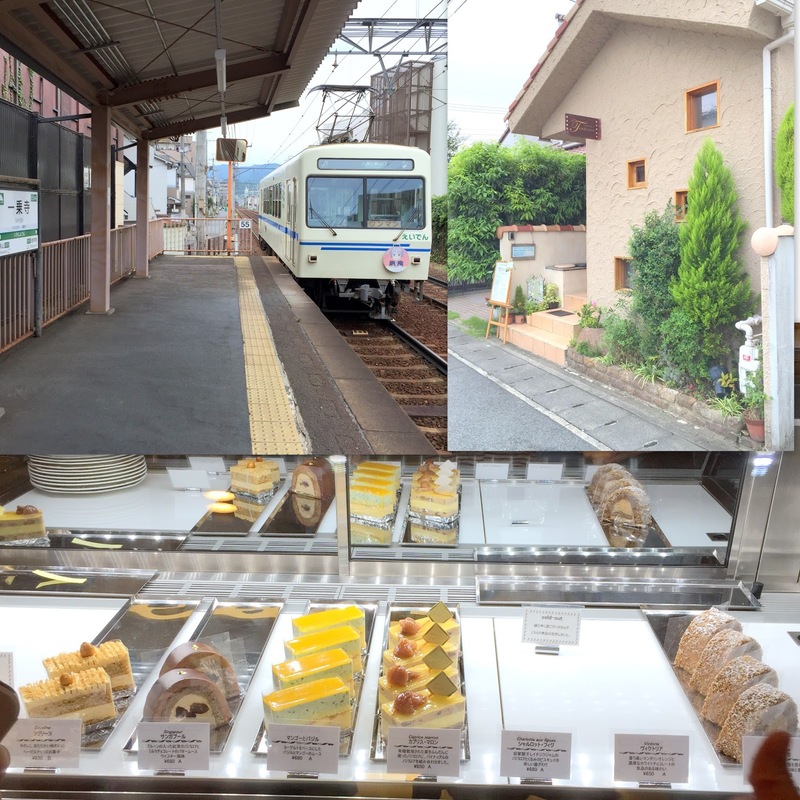 The quest for the best cake shops in Kyoto brought me to Tendresse, the highest ranked patisserie on tabelog. But a visit to this place isn't as easy as it seems. First, it only opens 3 days a week (Sat/Sun/Mon). Secondly, it is not located in any major train stations so one has to transfer a few times before reaching Ichijoji station. Thirdly, the shop believes in producing cakes in small batches so be prepared for everything to be sold out (or maybe left with 1 choice) even if you reach within 2 hours after the opening hours. Being a huge fan of sesame, I was elated to discover this casual cafe that specializes in all things sesame when I was walking along the streets of Karasuma Oike. Gomacro is a casual cafe produced by Yamada Seiyu, a third generation manufacturer of sesame oil whose mission is to protect the mothers who play an important role in raising the pillars of future generation. As such, one can expect that the food here is designed to be healthy, organic and gluten-free. In fact, you can see it as a vegetarian place as the food is free of meat, dairy, eggs, artificial colouring, chemicals, preservatives and even white sugar! My main agenda wasn't trying to be healthy (though it feels good to know that the food here is healthier than other places). I wanted to check out the signature white curry rice (¥1000) because I never had white curry before. The curry roux is made by slowly grinding white sesame and almonds by hand using a stone mortar, resulting in such a smooth and thick gravy that was full of nutty aroma. The spice here is non-existent and adding splashes of Sesame Rayu (Sesame chilli oil) contributed more to the aroma than taste. But still, I enjoyed the curry tremendously and thought it was a great delicious pairing indeed to go with the black sesame multigrain rice. For sweet ending, I had the duo of soymilk and black sesame icecream which was served with homemade sesame granola cookies. I couldn't say if I love the ice cream or the granola more but we all know that creepy crunchy bits can be very addictive. But the good thing is that their products from edible stuff like sesame oil, sesame paste and granola to cosmetic skincare items are retailed at the entrance of the cafe. The second level is a kitchen where cooking lessons on healthy organic food is conducted. Kumoya is the latest artisanal dessert place in town that offers Japanese-French pastries such as eclairs, yoghurt parfaits and pancakes that are as cloud-light as its Japanese name (meaning "cloud" house) aptly implies. In fact, it is no coincidence that the presentation and concept reminds one of the now-defunct Karafuru because this place is opened by the same owner who has reshuffled the kitchen and management affairs. With a wider menu that includes savoury items, the owner hopes to to widen the appeal to the masses, including firms looking for a place to host its corporate parties and also halal customers in the near future after it received its halal-certification. New highlights include the savoury pancakes with a Japanese twist such as Karaage Chicken pancakes and bite-size snacks. The tempura soft shell crab pancake was quite a sight to behold with lots of things going on in a plate; tempura capsicum, tempura soft shell crab, tempura cereal crunch, brûlée pineapples, mixed salad, with a triple stack of savoury pancakes buried all underneath. The moreish fritters went hand-in-hand with the wasabi mayo but I'm hesitant to say they were on good terms with the pancakes which could ranked as one of the few better executed ones in town. That said, I can imagine how delicious it would be if I had the Butter & Maple ($8.90) instead because the test-and-tried sweet savoury formula is hard to go wrong. New items aside, most people may still question the difference between the Kumoya and Karafuru. Recipes have been fine-tuned and the frilly elements are stripped off to showcase the theme flavors. For instance, the Matcha Yoghurt Parfait ($15.90), which formerly assumed the form of Matcha Jasmine, is now purely done in matcha. I missed the crispy Matcha Langue de chat which has been replaced by saccharinely sweet matcha macaron but the concept of a 和風-style matcha dessert is visibly reinforced with larger helpings of tsubu-an (coarse red been paste) and matcha financiers. Of course, this naturally implied that the sweetness has racheted up a few notches, but thankfully the tangy yoghurt soft serve placed it under well control. That said, a pure matcha syrup instead of matcha Creme anglaise might work as a better candidate because the taste of matcha here is as elusive as that of the iced matcha latte. Those looking for something sweet but more substantial can opt the same buttery pancakes served with yoghurt soft serve. We had the Tiramisu ($15.90) which was kissed by a shot of cold espresso instead of the usual Baileys or other alcohol. But I didn't felt shortchanged at all because the interplay of flavors and textures in the presence of fudgy yoghurt brownie and crumbly chocolate sables made this a delightful treat especially for people like me who enjoy coffee in my desserts. The eclairs have now been downsized for customers to try more flavors in a sitting. As pretty as they used to be, I would prefer if the choux pastry can be more tender and less dry. With 12 regular flavors to choose from, I would recommend you to go with your personal favourite flavors. At $3 per piece, these dainty gems would make an impressive gift when you get them in 3-pc/6-pc/12-pc box. The size of the eclairs might draw some flak but on a positive light, you will less likely over-indulge and leave this place feeling as light as cloud. With over 100 Michelin-starred restaurants in Kyoto, ramen seems to be the poor man's gourmet compared to kaiseki or any innovative French or Italian cuisines. After all, Kyoto isn't as well known for ramen compared to Hokkaido or Kyushu. However, in the most recent Michelin Guide released for Japan last year, there were 3 ramen-ya that were awarded Bib Gourmand in Kyoto. One of them was Inoichi but it isn't the ramen shop with the highest ranking on Tabelog, a review site more commonly used by the locals. In fact, I wasn't attracted to the ramen when I saw the pictures posted online because it looked pale and plain. How can anything like this ever be tasty? Riding on the trend of bean to bar, I went to check out Green Bean to Bar, the last chocolate place on my list. It's actually similar to the previous two, Dandelion Chocolate and Minimal Bean to Bar, as it places an emphasis on handmade chocolates from the stage of bean with only natural ingredients. Workshops are also conducted from time to time. This place is directed by Chloé Doutre-Roussel, a Paris chocolate expert who is not based at the shop (Chances are you will spot a handsome angmoh chef playing chocolate in the kitchen). Change is accelerating everywhere in Tokyo and one big major change in Shinjuku is the completion of NEWoMAN, a new commercial building that includes several F&B booths, book store, Zakka shop within the extended wing of JR Shinjuku station. Want to order a cake for a celebratory occasion but you want to impress with something special and unique? 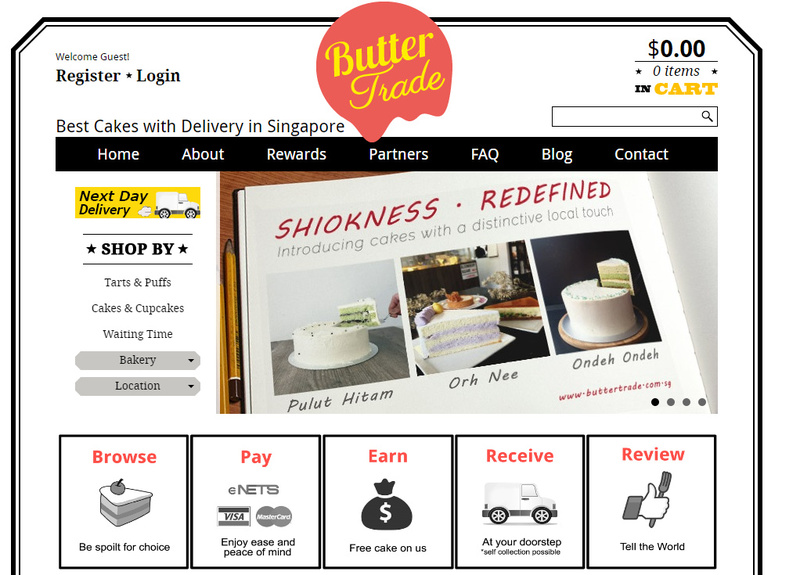 Check out Buttertrade, Singapore's first online portal that connects home-bakers and boutique cake shops to customers. Halal, gluten-free, vegan, kawaii, decorative, pet-friendly...you can find all sorts of cakes here that suits your need. Depending on the complexity/degree of customization of your cake order, it is possible to have your cake on the actual day as long as you order before 3pm the day before. Not only is this convenient, you can earn 3% rebates for each purchase and redeem them for more cakes next time. Recently, I had the opportunity to try out one of best selling cakes that are infused with local flavors. The Ondeh Ondeh Cake ($38) from In the Brickyard was a simply yet elegant construction of Gula Melaka buttercream and Pandan cake. It would be great if the cake was less sweet and moister but I'm certain that these sweet Asian-desserts inspired cakes have their fair share of supporters. Besides Ondeh Ondeh, there's also Pulut Hitam Cake and Orh Nee Cake. 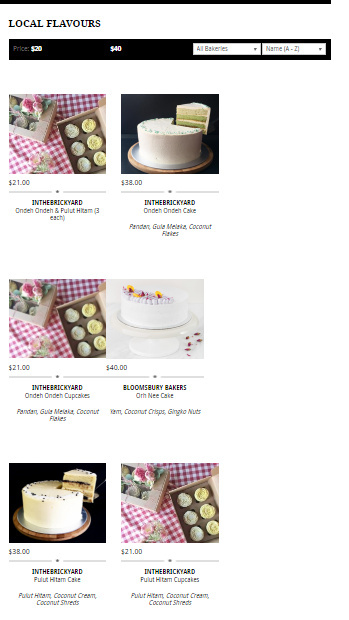 From now till 31st Oct, enjoy 15% of all items in "local flavors" shown above (link here) simply by entering the promo code "dairyandcream" when you checkout your shopping cart. Wait no more and start planning a cake surprise for your family and friends! Besides matcha and black sesame, the next most well-known Japanese flavor in desserts is probably kinako aka roasted soy bean. And Kissho Karyo specializes in just that. I have always love kinako, especially when it is used with kuromitsu (black sugar) to create mellow roasty notes. So I was curious to learn about Kisshoan, a modern mame (bean) shop that was opened by Kitagawa Satoru, the 16th-generation owner of traditional Wagashi shop, 桂華堂, back in 2006. While he continues to run Kisshoan as an online business selling modern western-style sweets with a Japanese twist, Kisho Karyo was opened in Higashiyama that serves as a retail shop and tearoom where guests can enjoy desserts such as parfaits, kakigori that revolves around the core ingredient--kinako. Located a short walk away from Soi 19 Wanton Mee is a newly opened cafe by a group of 4 young friends who decided to give up their corporate jobs to pursue their dreams in the F&B industry. The concept is pretty much similar to most ice cream-waffles shop in Singapore except that there is an additional corner for live music. The ice creams are churned from an offsite kitchen factory based on their own recipes and there are more than 10 flavors including cotton candy, tiramisu and premium Mao Shan Wang Durian. There are two types of waffles-the Liege Waffles ($5.50 for a mix of red velvet and original) and the Belgian Waffles ($5.50 for a mix of red velvet and original) which you top up with ice cream for $3.90-$4.40 depending on the flavor. Of the two types of waffles, I prefer the Liege Waffles because of its crispy sturdy structure that held up well against the ice cream. But it didn't behave like how a Liege waffles should be; slightly chewy, buttery with a thin glistening coating due to the caramelization effect of the pearl sugar. Don't get me wrong, they were tasty but just that I naturally expected some differences between this Liege and Belgium waffles if both were written on the menu. Otherwise, calling them "waffles" would suffice if they were intended to have the exact same crispy exterior and feathery light innards. On the other hand, the Belgian waffles were slightly wet on the inside. The ice creams did not disappoint as they were smooth velvety without being too sweet. Our favourites include the Sea salt caramel & almond and Thai Milk Tea. 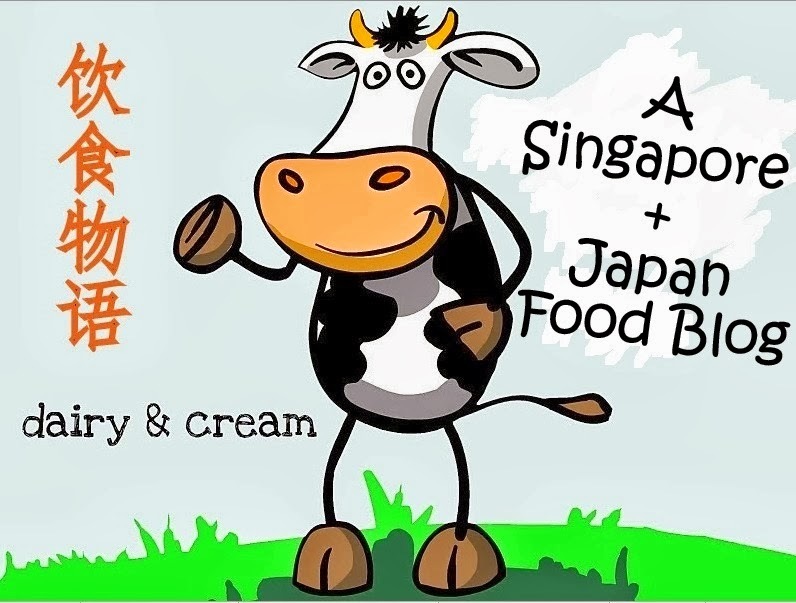 With the intense competition in the local cafe scenes in Singapore, I think Madcow can attract a wider crowd if it can neat out existing issues with and find something which makes it stand out from other ice cream cafes. At least for now, I know where I can head to for some quick ice cream-waffles fix. The Uncle was preparing his noodles in all too-dramatic movements that seemed like watching a dance choreography. From all the tossing, lifting the noodles drainer way high up above his head before emptying the noodles into the bowl, all these resulted in an average of at least 3 minutes preparation time for just a bowl of noodles. As a result, the queue barely moved after 45 minutes even though there was no more than 8 pax in front of us. Opened in July 2015, Knot Cafe is a cafe where you don't have to be hip to enter. The building is distinctive-the red bricks walls and wooden counter table reminded me of the forest loghouses or even barnyard farm house-but nothing too out of place since its concept is a fusion of Kyoto and New York. It started selling coffee using special selected beans from Cafe Grumpy but rose to popularity and fame with its quirky dashi-maki burger. 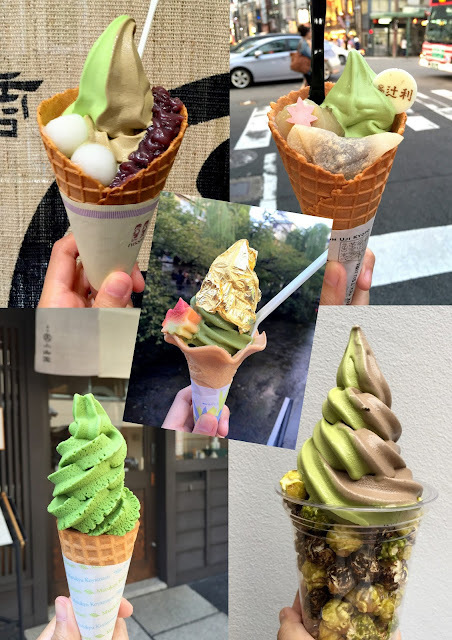 As a place famous for matcha, Kyoto is dotted with numerous shops selling matcha soft serve, especially in touristy spots near shrines. While I haven't try out all the matcha soft serves (neither do I have any plan to do so), here are 5 matcha soft serves which you might be interested to check out. These are churned from established tea houses so at least you know what you are having and not just run-of-the mill soft serve that most likely outsourced their matcha from somewhere.